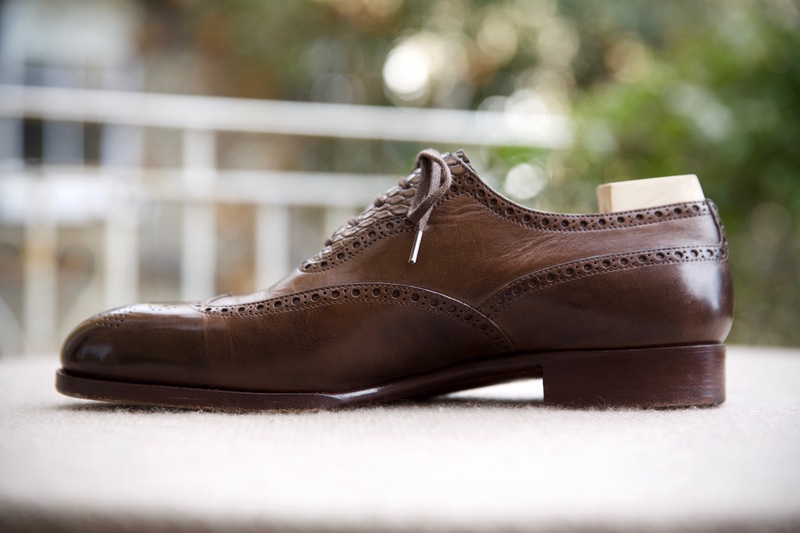 If you like the style and structure of Saint Crispin's shoes, they offer some of the best value available anywhere. Pictured here is my first pair, made a couple of months ago - a wingtip in brown, with an alligator adelaide section around the laces. We had a couple of issues with the fit and style, which I will go into lower down. But overall I am very happy to recommend them and the service. Key to that recommendation is price. 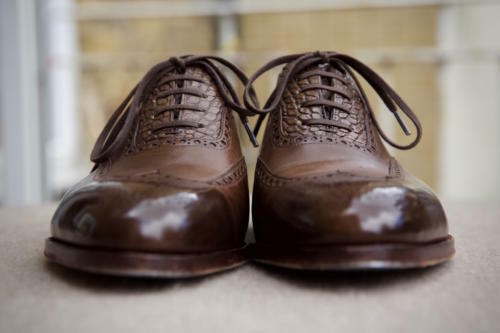 Saint Crispin's shoes cost 1350 euros which, while still an awful lot of money, is a hell of a lot less than bespoke shoes with many of the benefits. And now around the same price as Gaziano & Girling (depending on the exchange rate). For that price you get a hand-sewn welt - which you won't see on any of the English makers, and very few elsewhere - and beautiful finishing through the waist. You get a hollowed-out shoe tree made on-site. And you can usually make-to-order at no extra cost. Saint Crispin's is able to do made-to-order easily because it has such a small production (about 1600 pairs a year) in its Romanian workshop. In fact, about 65% of the business is made-to-order, so ready-to-wear lines interrupt the flow of MTO, rather than the other way around. Even the 30% of the business that is RTW is mostly small, personalised orders from various retailers (eg The Armoury, Leffot, Skoaktiebolaget). And this is to leave out perhaps the most interested aspect of the Saint Crispin's offering - the personalised last. For 500 euros, a customer can have a standard last personalised to his fit. This is a one-off payment, to cover the cost of making the last and not being able to use it on any other shoe. Once it's paid, that last can be used on any new shoe, for the standard price of 1350 euros. So the key question is, does this personalised last approach the fit gained through bespoke? The process is not that different, in an age when many bespoke makers start from a pre-cut last (rather than a big oblong of wood), but do the results match? On the evidence of my shoes, yes and no. Zach (Jobé, at that time at The Armoury) and Phillip (Car, Saint Crispin's, who did the fitting) got the difficult things right: the fit around the heel was perfect, as it was through the arch and joints. But a couple of easy things went wrong. The shoe was too short - almost half a size - which caused my toes to touch the end when walking. And arguably the advice on the style could have been better, as the narrow wing-tip design doesn't quite suit my wide-joints-and-narrow ankle foot shape. It leaves too much space between the brogued line and the edge of the shoe (see top image). But I must bear at least partial responsibility there. Phillip has offered to re-last the shoes to correct the issue, and says he is usually happy to do so with other problematic fits. There is usually a small charge for this (around 100 euros). This re-lasting can also be done to improve a first pair, after a better second pair has been made. This is in keeping with Phillip's general advice that a personalised last is worth investing in if you think you are likely to eventually buy 2-3 pairs. (The logic is similar with bespoke shoes - although not usually stated that baldly). In fact, Phillip has always argued that bespoke shoes should include a 'fit guarantee', where the maker is prepared to make as many pairs as needed to get the fit perfect. He does a very small amount of bespoke work at 4500 euros, with such a guarantee. He argues that all other bespoke makers should offer something similar - that this is why bespoke is so expensive. Although doubtless English and Italian bespoke makers could be a lot cheaper if they were also making in Romania. Which is not to diminish the Saint Crispin's factory at all,. As I have stated many times before, my principle is that I don't care where something is made, only about the quality. And the quality level at Saint Crispin's is superb. The bevelling of the waist on a rubber sole; the initials in nails; the finishing of the uppers. Actually, the way Saint Crispin's dyes its uppers is perhaps as interesting and distinctive as anything else. For most shoes, it gets uncoloured, natural crust leathers from the tannery, cuts the pattern pieces and then dyes them itself to get the colours it wants. With some dark colours - particularly black - this can mean multiple dying stages. 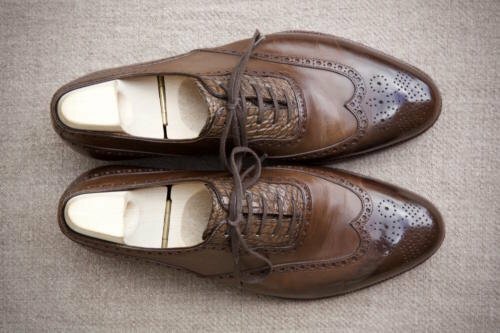 Of course, you can change the colour of the shoe subtly yourself, through coloured creams and polishes, but it does mean that a Saint Crispin's shoe gains an antiqued and worn look quicker than others. In a way, this is a third approach to finishing, to sit alongside the dominant methods in England and Italy/France: the former tend to get coloured hides from the tannery and finish them with burnishing and finger polishing; while the latter are more likely to hand-paint a patina (painting with dyes). I really like the affect, and you can see it on my shoes a little already, after only 12-15 wears. But I do understand that it also won't be to the taste of every Northampton customer - just as many don't like bright, brushed patina finishes. This is a nice segue into another important area: structure. 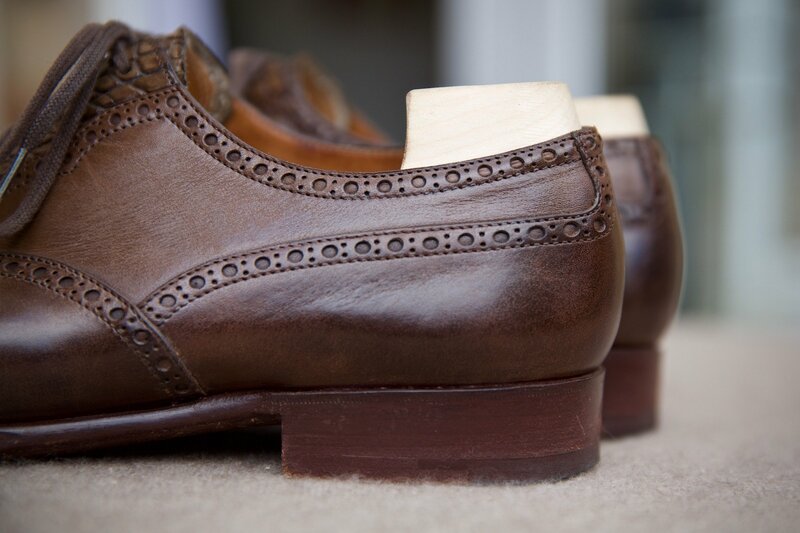 Saint Crispin's shoes have thicker and longer stiffeners than most makers. This means they feel stiff and take longer to wear in. The advantage is a cleaner, smoother look to the shoe. You are likely to see fewer wrinkles away from wear the foot bends. 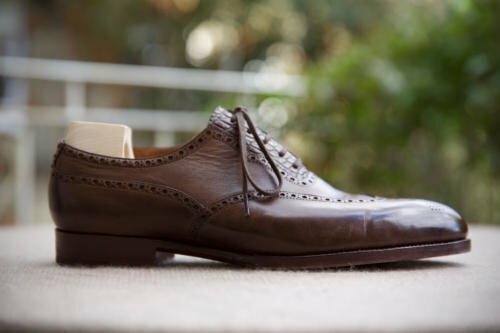 Most English shoes have a decent amount of structure (certainly compared to the Italians), though Gaziano & Girling has a little less, which is one reason their shoes take less time to wear in. That structure is the one thing I'm not sure I can get used to in Saint Crispin's. But then I know guys who like a snug fit, and love this feeling of being held tight in a really robust - yet elegant - shoe. My advice would be to try Saint Crispin's shoes wherever you can, and see if it's for you. Saint Crispin's are stocked in quite a few cities around the world (see list here), but not in the UK. And those that would like to see Phillip rather than a salesperson in one of the shops can have to wait awhile - given he is globetrotting the entire world on his own. This is something Phillip is trying to improve on, including increasing the number of local agents that can do fittings on his behalf. As well as the personalised last, customers can have temporary pieces added onto the standard lasts to help improve the fit in one or two places (for a small fee, perhaps 150 euros). You can follow the discussion on Saint Crispin’s shoes – Review by entering your email address in the box below. You will then receive an email every time a new comment is added. These will also contain a link to a page where you can stop the alerts, and remove all of your related data from the site. Simon, following through your articles on St Crispin’s shoes let me to the item on the dainite sole, and got me wondering. I take city breaks as often as I can. I’ll be walking on pavements from getting up to getting back to the hotel to rest, shower and prepare for dinner. This is repeated for two or three days, and the soles of my feet suffer, as do my knees and my back. I find dainite more of a country sole, a little too hard for pavement pounding. I have a (particularly ugly, but very comfortable) pair of Mephistos which I tend to wear but would prefer something more attractive. My trousers for these occasions are usually chinos. What are your thoughts and suggestions? Comfort is a very personal issue, but a thin rubber sole might work well and provide a little more cushioning, and be more elegant than those Mephistos. 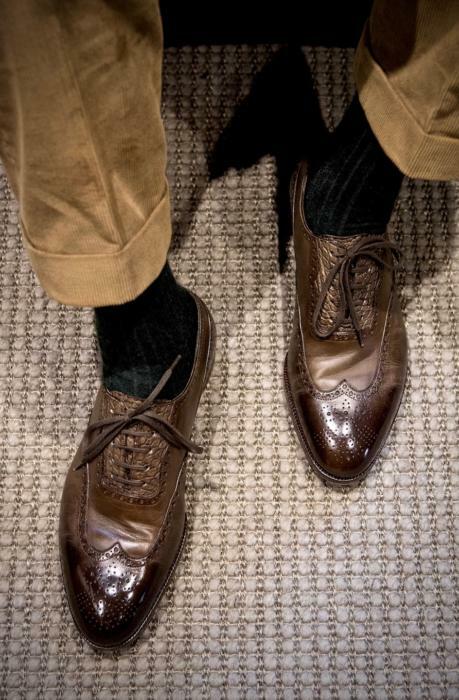 As to the style of the shoe, something versatile like a split-toe derby (eg Edward Green Dover) might go well from walking around all day to evening. Hello; perhaps have a look at shoes with crepe soles – something like the Sanders chukka boots (as worn by Steve McQueen), they have a thick, comfortable, crepe sole. I think they work well with chinos, given their very casual style. Galling to hear that trees take 8 hours to make – my latest pair from Cleverley have been held up for weeks waiting for the trees! Bear in mind you can’t always do those 8 hours straight, and there may be a long queue in front of you. I think they are having problems with their treemaker. Simon, please make attention to Silvano Lattanzi. I use them mor then 15 years and a have many pairs of them. They really very good hand made shoes. Turns out the backlog at Cleverley is because Teemu has left. Simon, Since I am unaware of a place for “general comments” and the topic is footwear, I feel this as likely a place for this post as any. One of your colleagues at the FT, the rather hip Janan Ganesh could use a little input in the footwear area. His commentary, and intelligence are beyond reproach, and he brings a sharp eye, and keen observations to all that he does at the FT. However, he needs a second pair of boots, shoes, whatever. Regardless of what he is wearing otherwise, he wears the same pair of I believe purplish boots…If nothing else, it violates the “never wear the same pair on consecutive days – give them a rest” rule..
Perhaps you could either make him a subject for a column on “upgrading”, or at the very least take him shopping. what is re-lasting simon? does it mean stripping the upper off the sole and putting back on the last before reassembly? I have to say, if I’d payed €1800 for a pair of shoes and they were delivered a 1/2 size too small, disappointed would be an inadequate description for my emotions. This hardens my opinion that bespoke or MTM shoes aren’t worth it unless you have very unusual feet. Personally I wear Santoni or Lobbs for formal and Tod’s for casual. They fit me like a glove, are good quality and are a fraction of the price. My most unfortunate adventure was with Berluti. They sold me a pair that were so painful they would have had the Gestapo smiling. I’m going to spend my hard earned wonga on bespoke suits and shirts that fit. How much extra did the gator adelaide portion end up running you? I really like that choice…makes for an extremely sharp look. Great article, as I have been waiting to hear your thoughts on one of my favorite shoemakers. I agree the waists are lovely and it is a bit of a shame that the heal doesn’t compliment it. Only thing I would disagree is that my Crispin’s have been very comfortable right out of the box. Maybe I should try G&G as I prefer that to having a longer break in period. BTW, Is your shoe last based on the Crispin ‘classic’ last? I’ve been waiting for this review for quite some time. It’s really interesting how St Crispin construct their shoes! To me these are truly lovely oxfords! Now that you have tried them out, how do you feel at your toes when wearing them now? As to the construction, presumably, using a leather instead of wood or metal shank does make the St Crispin’s quite comfortable. Do you feel any difference with your other shoes? The trousers perfectly suit to this kind of shoes. What kind of corduroy is it? Spot on review. I recently took delivery of my first Crispins mto (Monks in burgundy calf w/ alligator uppers) through leffot and they are finished wonderfully, have a decidedly bespoke-ish waist and they definitely have a certain “heft” to them that feels like quality. I had walked in to the shop quite certain I was going for G&G and after handling a few pairs I was sold on Crispin’s. I rather enjoy now knowing they are made in Roumania and somewhat off the beaten path. All the best. Simon a quick question about your beautiful A&S corduroy suit – who supplied the cloth. Was it Zegna? Thank you for the review of Saint Crispin’s. Even is they are high quality I consider the price to high knowing the cost of labor in Romania. Nice article Simeon. I’m curious whether you paid full price for these shoes? I think it’s always fair to reveal what is actually going on with reviews like this, so I was just curious whether you received some sort of discount. Is it standard practice for you to reveal special deals or do you always pay full price? It’s a fair question Andy, but I have covered it many times in the past. Briefly: I regularly receive discounts, rarely get things entirely free, and either way it makes no difference whatever to the review. Because if I want something I have the funds through the blog to pay for it, and I’m never going to want something just because it’s cheap (or free) as I have far too much already. Hope that makes sense. Perhaps more importantly, I have always been very clear that no one can ever pay for coverage on Permanent Style – and frustratingly that is what brands want more and more. And all magazines (and most blogs) are happy to do that. Here I did receive a discount. Thanks for this, Simon. One thing I was hoping for slightly more detail on was the benefits of hand welting, over machine (Goodyear) welting. From what I have read (I admit, mostly on dangerously pedantic internet forums) hand welting is by far the superior construction because of the absence of a glued cloth holdfast known as “gemming”. How important is hand welting to you? (And why?) After reading what I have, it’s difficult to avoid the thought that spending large sums of money on shoes manufactured by the more expensive manufacturers that produce Goodyear welted shoes (particularly Edward Green, where the prices begin to approach those for Saint Crispin’s) is not the best use of money. (In the same way that once you learn a little about jacket construction, you start to want to avoid fusible, and get a fully canvassed garment, wherever you can.) Do you ever have the same thought? How important is the hand-sewn sole? 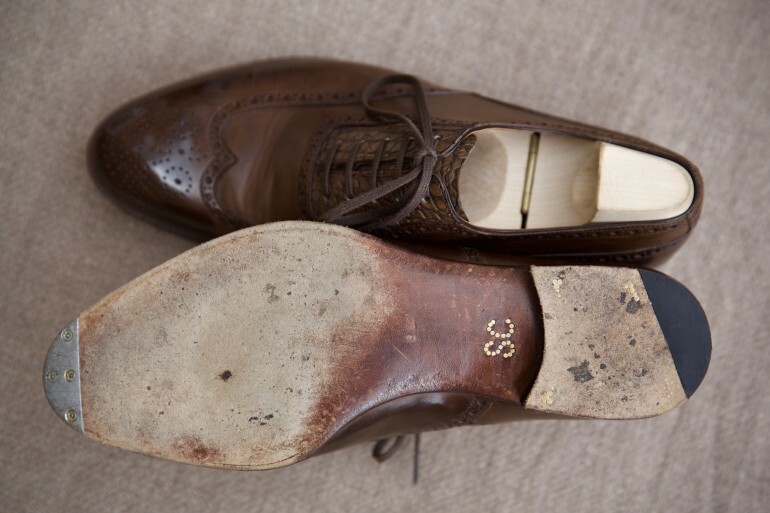 When replacing a sole St. Crispins hand sews it, so repaired shoes have more handwork! How did you find the arch support compared to other shoes? Not that important again, which is rather shown by the fact that the choice is made by expediency and volume rather than principle. The arch support is very good. Plus you can reduce it with a slight change to the last (not the full personalised last) if it’s too much for you. My St Crispins finally arrived this week. The fit is spot on, so I was a bit luckier than you here. However their standard last was already very close – we only had to make minor adjustments with added pieces to the last. I did notice the added structure, however it hasn’t bothered me yet – I still find these shoes extremely comfortable. One minor thing you didn’t mention are the beautiful bags these shoes come in! Did you ever get these back? How were they after relasting? 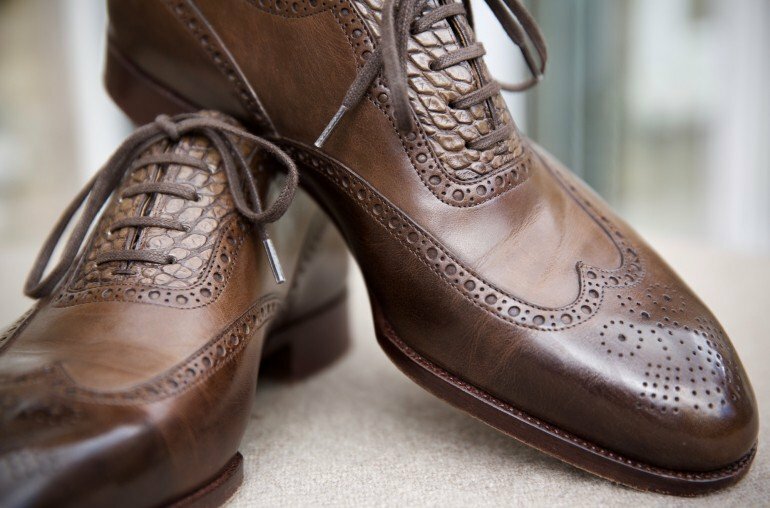 I’m planning to buy my first ever pair (or 2 pairs) of high end shoes (Not bespoke), would you recommend Saint Crispin’s, Edward Green or G&G? A colleague recommended Crockett & Jones because of its value, but I wouldn’t mind paying a few hundred £ more if the above options are better quality. My aim is to slowly build a shoe collection that only consist of high quality leather shoes. I would like to know where to start. I used to buy a lot of fashion brand shoes like Kenzo or Paul Smith as I didn’t know any better. They weren’t cheap but now I realize I should probably go for proper shoemakers if I’m going to spend the money. Should I buy at least two pairs as I shouldn’t be wearing the same pair every day? And in terms of styles, should I just stick with Oxfords in different colors? I applaud your endeavour. These are some large questions, which have been answered around the website but I can’t really reproduce answers to here. I suggest you look to the ‘shoes’ section of the site and do some reading first. If you have any follow-up questions on any of those posts, please leave a comment on them and I will answer there. Hi Simon, where did you do your fitting? It doesn’t seem that they come to London anymore (at least not regularly). Excellent review. I am going to look into Saint Crispin’s shoes. I have not had a good experience with John Lobb. I spent a lot of money on a bespoke pair. Lobb tried for three years to make them work for me. They gave up. I don’t know what I should do with Lobb. The shoes now sit on my shelf as a paperweight. Would you recommend these over Tim Little Bespoke — particularly from the point of view of aesthetic features? More generally who would you recommend for a cheaper bespoke shoe, particularly concerning aesthetic details (sculpted waist, nice heel, ect…)? Thank you very much. Love the blog, best around, great informed international comparison of sartorial affairs! Great, thank you cery much for a quick and helpful answer ! And sorry between Cleverly Bespoke and SC – again from the point of view of aesthetic features? Great, thank ou very much! Great review, it helps me a lot when I was in the process of commissioning my St. C.
I commissioned my first pair of St. C, a pair of black oxfords, a little bit more than a year ago, but the forefoot was too narrow that it was painful. I’m in the process of finalising my personal last, and I have received trial shoes from St. C. I have narrow heels, low instep, high arch and my left foot is roughly half a UK size longer than my right. I would like to ask a few questions regarding fit. I have narrow heels, which means some fairly perceptible slippage in the heels. The tight toe area in the original oxfords have mitigated that, and St. C have factored that in the trial shoes, yet there are still some slippage. Are there any measurements that you would recommend me taking of the heel area, or if it might be addressed by shrinking the topline or the heel cup by a few millimetres? The second question is regarding fit in the inner ball of the foot. My right trial shoes currently fits well around that area, whilst the left foot is somewhat concerning. In the original pair of oxfords, there is some fairly perceptible pinching in the inner ball of the left foot, the personal last, while addressing it to some level, is still problematic, since the pinch is still there. Would it be addressed by stretching the area a bit more, or is it also due to the fact that the ball of the left foot is not placed at the right spot? I would greatly appreciate your advice on these matters, since I would love to commission more St. Cs in the future, and I would like to get it right as early as possible. It is a fairly expensive investment after all. It is very hard to give advice with descriptions in text I’m afraid. But it sounds like you could do with the heels being a little tighter – just describe the issue to them, not your proposed solution – and some more space around the ball on your left. Hi Simon, I see now on the SC website that, upon customer request (and I presume for a fee?) that they offer a trial shoe for your personal last. Did you consider this option, and if you did not, would it have been a way to more quickly adjust your fit issues? I can do a fuller piece, but the quality is not bad, just different. The fold across the toes does crease more and they do get an aged look quickly, but I really like that. Many shoes never look that good. It would be great if you could do a fuller piece or even a follow up on how your shoes have aged. There is a general misconception where people think shoes should look like they’re fresh out of the box even after being worn. I think worn shoes look much better, full of character. That’s comforting to hear, as I’ve heard a couple of bad things on the upper of the crust leather from SaintCrispins. Thank you again. No problem J, I’ll plan one. I completely agree, I find my Saint Crispin’s need a little more regular looking after and polish, but I love the way they have aged. Hi Simon, given the aging effects of the crust leather, would you recommend it for black dress shoes? Seems to me like it might make more sense for brown, slightly more casual shoes that quickly develop a nice patina. As always, thanks very much for your advice! I have an appointment coming up with Saint Crispin’s in Vienna and wondered about the metal tips you chose – what’s the purpose there? Esthetics only, or durability, or both? I’ll likely go for brown suede chukkas on rubber first to cover most walks of life. Are you still happy with your choice of suede, sole and colour? Apologies for crossing over your various posts on Saint Crispin’s. 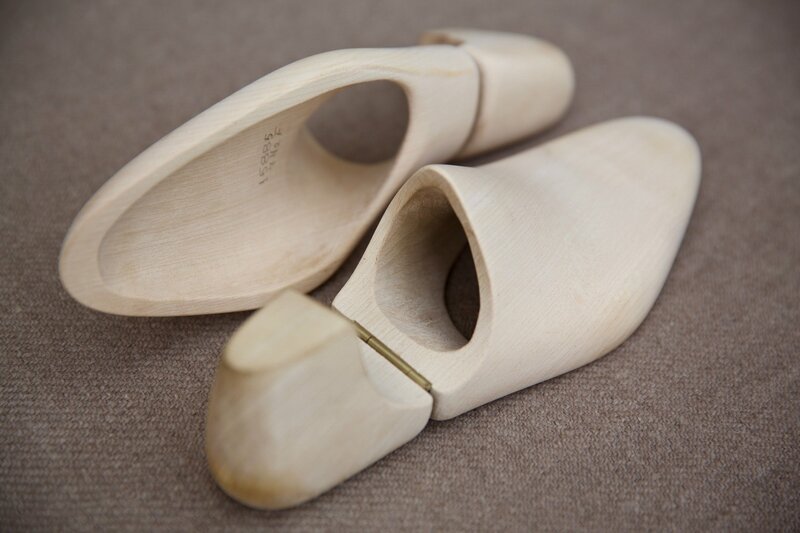 The metal toe taps are entirely practical – I walk quite heavily on my toes, and they wear away quickly. Is St Crispin unique in offering a personalised last without going fully bespoke? Are there other shoes makers who offer a personalised last? Which shade of crust leather are the wingtips? CRU 006? If you order a couple of pairs of shoes & on the 4th attempt, they aren’t to your satisfaction due to fit issues (pressure on the little toe), is there any way to get your money back? I have been in disputes for about 6 months due to the ‘no money back’ policy, but have not wanted to continue the working relationship due to the lack of progress in deliveries.